Man, those folks at Shout! Factory really push the nostalgia buttons, don't they? 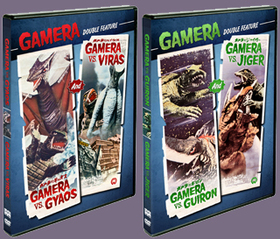 After their releases of Gamera the Giant Monster and Gamera vs. Barugon in DVD special editions, they're returning to the giant turtle with a pair of double features -- Gamera Vs. Gyaos / Gamera Vs. Viras and Gamera Vs. Guiron / Gamera Vs. Jiger . All four films will be presented in their original Japanese versions. Both double feature DVDs will be released on September 21, 2010 and carry a suggested retail price of $19.93 (you can pre-order them from Amazon.com by clicking the set titles above). Below you'll find the film descriptions from the press release to further whet your appetite for kaiju carnage. As a competitor to Godzilla in the Sixties, Gamera developed a strong following in and out of Japan, and with Gamera Vs. Gyaos his most famous enemy emerged, one that would play a key role in the Gamera trilogy released in the '90s. Like a giant bat fused with a shark's head, the laser-spewing Gyaos is discovered in an ancient cave by a young boy named Eiichi and a reporter named Okabe, whose neglect of the child in crisis leads to his death. Once Gyaos is unleashed upon Japan, both Gamera and the country's Self-Defense Forces try to bring down the flying terror. And that's not going to be an easy feat! Kids take an even more prominent role in Gamera Vs. Guiron as two star-gazing Japanese tykes get whisked away by a spaceship to a planet where two "groovy spacegirls" are the sole survivors of a once-superior civilization. But the seemingly hospitable women have sinister plans in store, and Gamera comes to save them and battle their rhino-like guardian Guiron, a formidable beast with a razor-sharp steel blade for a snout. This is one Gamera movie that needs to have the Japanese version seen as it features possibly the worst dubbing job in Japanese monster history. But it's still a camp gem. Space Gyaos makes an appearance, too! Our favorite flying turtle gets a female foe in Gamera Vs. Jiger, which is set around the 1970 World's Fair in Osaka. When scientists discover a mysterious statue called The Devil's Whistle on a remote island, they steal it away to show at the Fair, which causes it to unleash a high-pitched sound that disturbs the Triceratops-like Jiger, who comes after them to stop the auditory pain she is in. And when she faces down Gamera, she proves to be a nasty foe, able to shoot quills from her head and a heat ray that can dissolve entire city blocks, plus she has a tail stinger that implants eggs into her victims. Gamera eventually has to cope with a baby Jiger growing inside of him. You've got to love the lovably twisted Japanese concept of family entertainment: No holds barred monster smackdowns! Tell us how Gamera saved you from alien monsters in the comments. Submitted by nvadr on Tue, 2010-08-31 18:00. I have already viewed the first two releases of Gamera by ShoutFactory and I must say they are quite glorious and vastly superior to anything released in the United States. I prefer the Japanese version, with more accurate subtitles to the old dubbed versions which ended up being mocked by MST3000. "Gamera The Giant Monster" appears to be the same stock offered to the Japanese by Toshiba. I viewed both and can find no differences. The same goes for " Gamera Vs. Barugon " which I believe is also the same copy used in the Toshiba/Daiei Japanese versions. The colors in GvB are absolutely beautiful and immersive and will leave kaiju fans extremely pleased. Lets just hope ShoutFactorie's next release will look as good.. These ShoutFactory releases are a must have for giant monster fans! Submitted by Missy Yearian on Wed, 2010-09-08 08:10. Let's not forget that they are also the folks responsible for releasing all these wonderful seasons of Designing Women. Oh, wait, that doesn't matter here, does it?